Earlier this year I gave a talk about seed saving in Hereford at a brilliant seed swap. 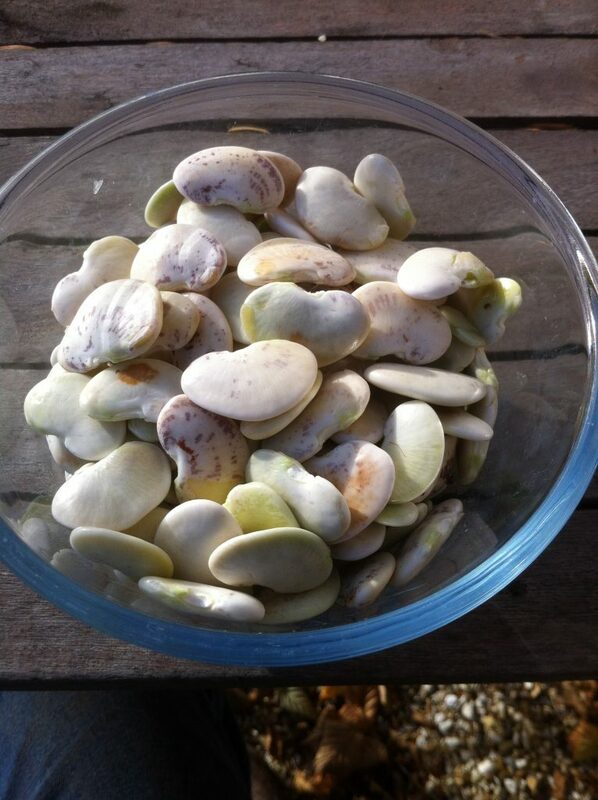 I had lots of my own seeds to share and the event organiser Suzanne Noble took some Angry beans home to grow herself. I sowed a few in late May in a large tub and grew them up canes. I wanted to see if I could harvest anything from such a late sowing. 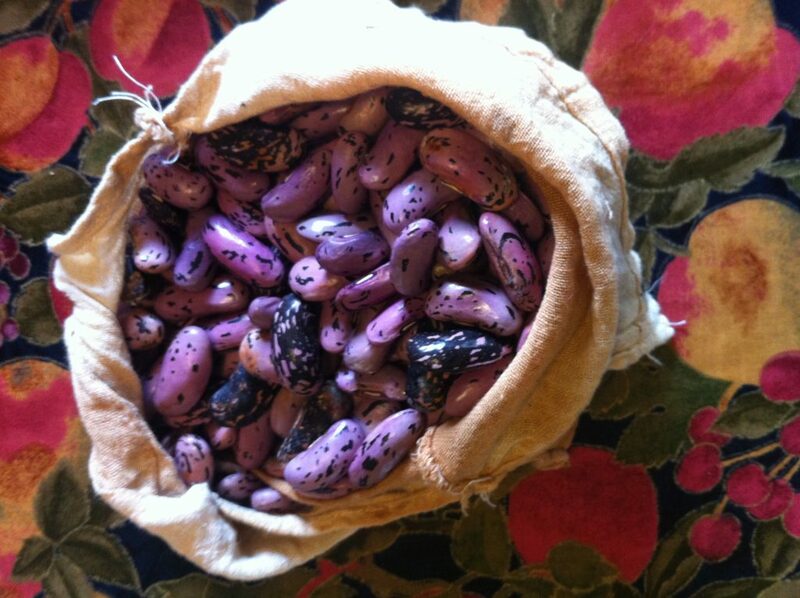 Normally I would sow this bean in April in pots in the greenhouse and plant out in a warm, sunny spot in May. 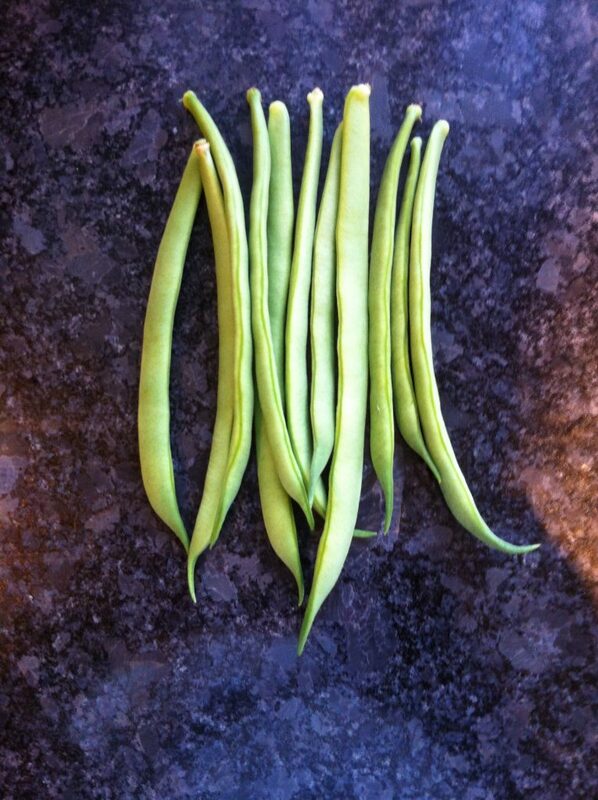 They beans have not ripened,due I am sure to the shortened growing season but I have still got enough for a good meal. 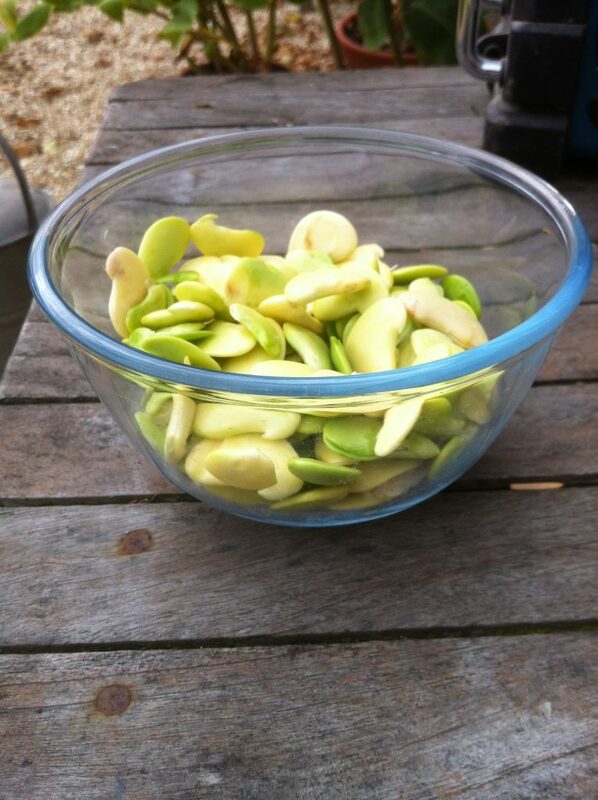 I shelled the green pods and then spent a happy half-hour skinning them. I will boil them for about fifteen minutes until they are nice and tender and then stir-fry them with some garlic, a little Burmese chilli, a good splash of soy sauce and a sprinkle of fresh parsley – a sort of Anglo-Burmese food fusion! I have started to update my seed lost for 2017. Check it out. there will be more new varieties I have yet to finish saving to be added this winter. 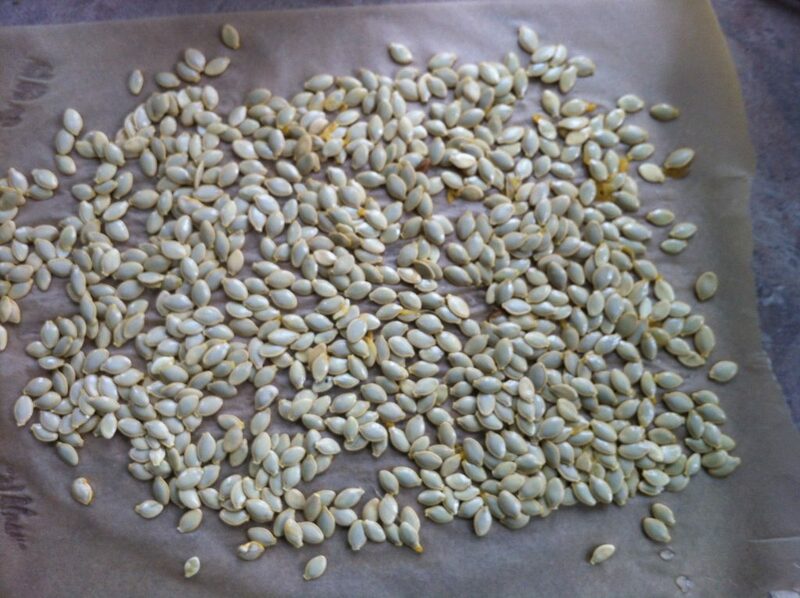 I am happy to send seeds when I have them and the seeds are free. However, I really appreciate a donation of £1 a packet towards the cost of the envelope and keeping my seed library. You can just include some stamps with your S.A.E. or make a donation using PayPal account adam@veggingoutwithadam.com Please do email me before placing an order so I can confirm availability. It’s been a good year for peas and I have enjoyed growing a number of familiar as well as new additions to my library for culinary pleasure, to return to the Heritage Seed Library and share with fellow vegaholics. My absolute favourite new addition is Jeaune de Madras. An old French variety given to me by Gerrit Oshan from the Dutch Gene Bank in Utrecht, I am told this gorgeous and most decorative mange tout is the source of a breeding effort in the USA to develop an improved variety – not that I think this beauty needs any improving. I have had good crops of old English stalwarts of the HSL. Robinson, unimpeachably one of the most delicious peas you will ever eat. Considerd by the RHS at the end of the nineteenth century as one of the top ten peas in the world, Champion of England is another stately and yummy variety. But you have to grow this one yourself if you want to savour its special qualities. 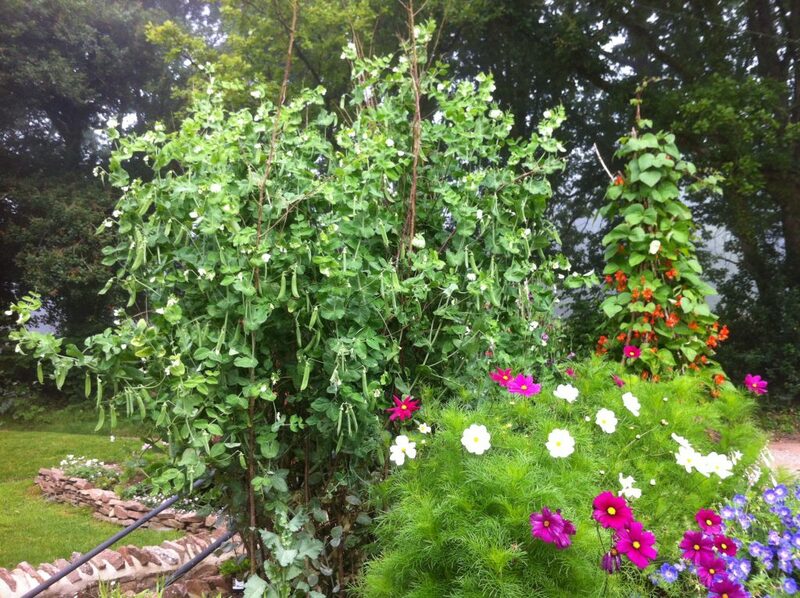 Peas come in all colours and I have grown three purple varieties this year. 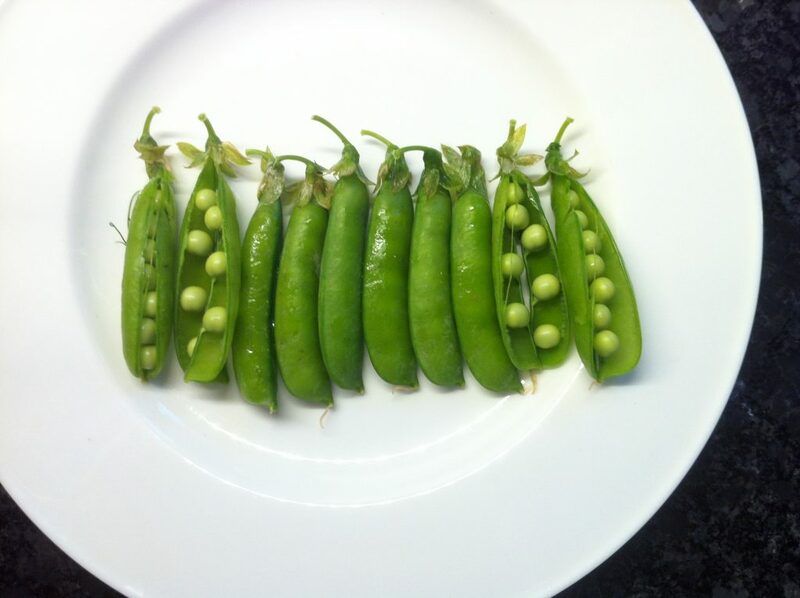 Two are from the HSL and well worth growing for their delicious, pale, small peas. 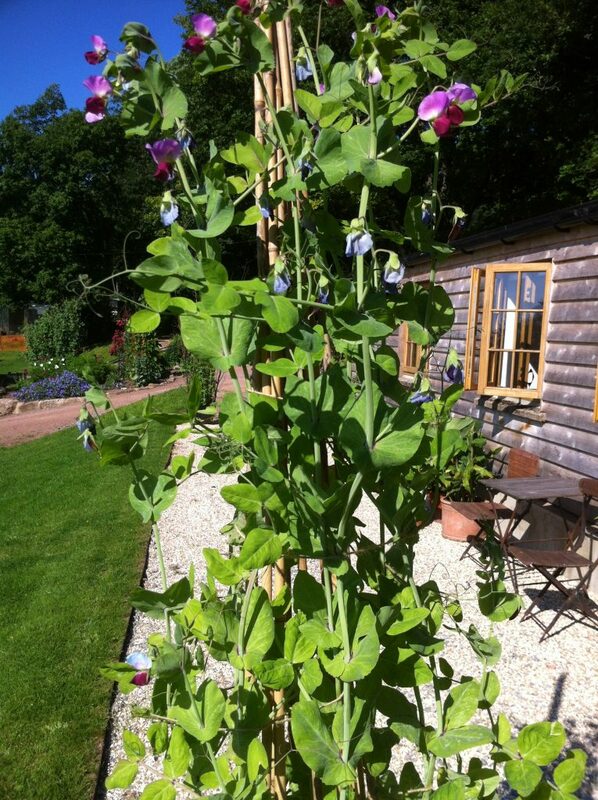 Sutton’s Purple Podded is a tall pea with delightful flowers and easily picked pods. Betony Blue has shorter and rounder pods with larger peas than Sutton’s Purple Podded. 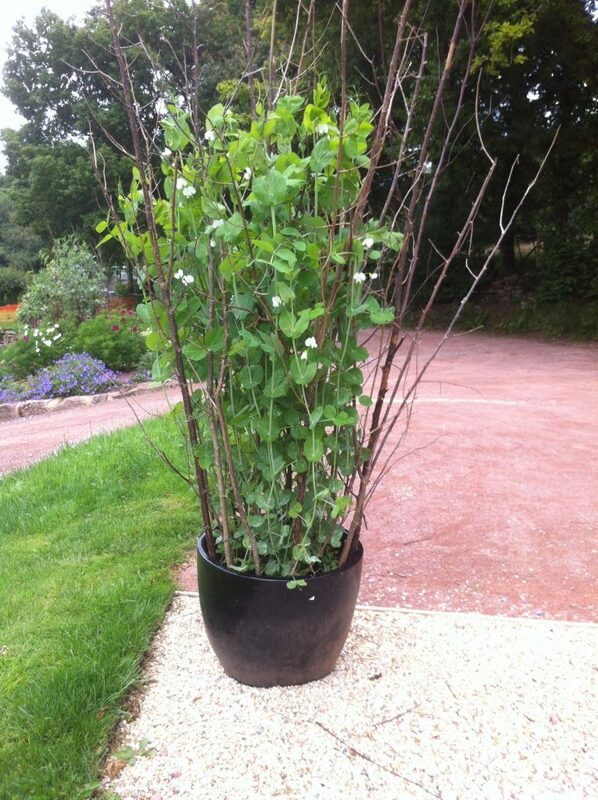 Like all tall peas, they grow well in large pots or tubs and can grace a flower border too. 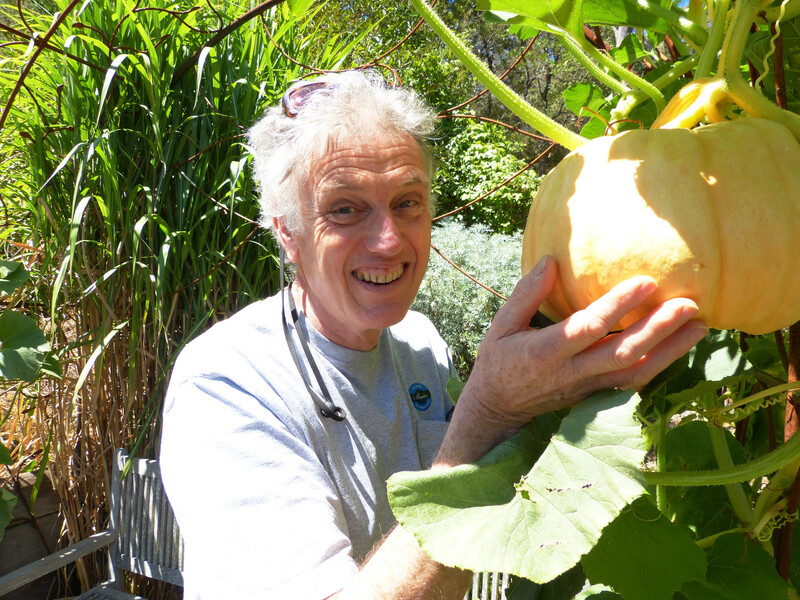 Often fellow growers offer me vegetables with unusual stories. Liam Gaffney who grows in Inverness-shire sent me Daniel O’Rourke. 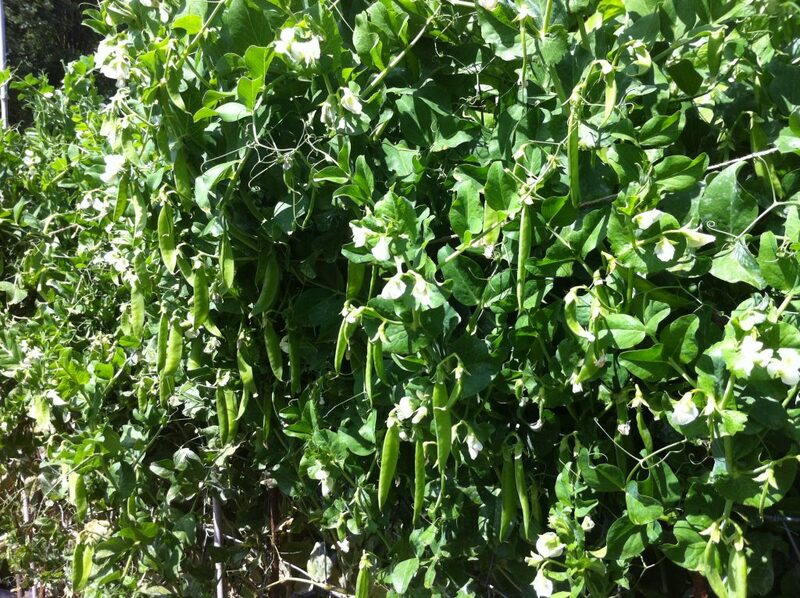 It grows to up to 2 metres with a heavy crop of small pods filled with sweet little peas. It is dual purpose so the dried peas can be used as a soup pea in winter. Daniel O’Rourke is an Irish heritage seed that comes from the Irish Seed Savers’ Exchange. However, the provenance of the pea is mysterious. It was originally saved in the Russian seed bank in St. Petersburg that was founded by Vavilov at the start of the 20th century. Vavilov travelled the world collecting seed to put in the world’s first proper seed library. So, did Vavilov ever visit Ireland and bring this pea back to his library or did Daniel O’Rourke get the seed from Vavilov? 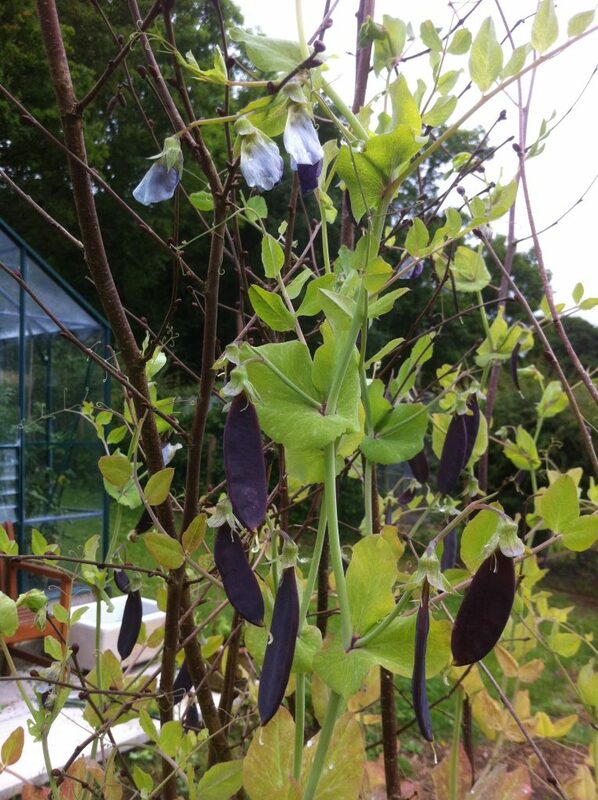 If so, what is the origin of this pea which has double flowers and is the result of selective breeding. The Belgians also bred peas and another HSL variety I have had very good, heavy crops from is Espoir de Gembloux. 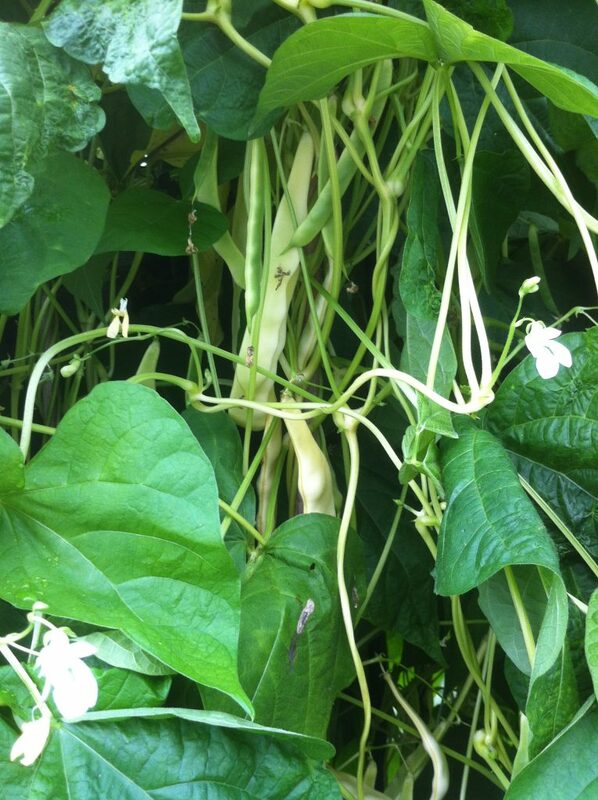 it grows to about 1.2 metres and is a very heavy cropper with a abundant well filled pods. 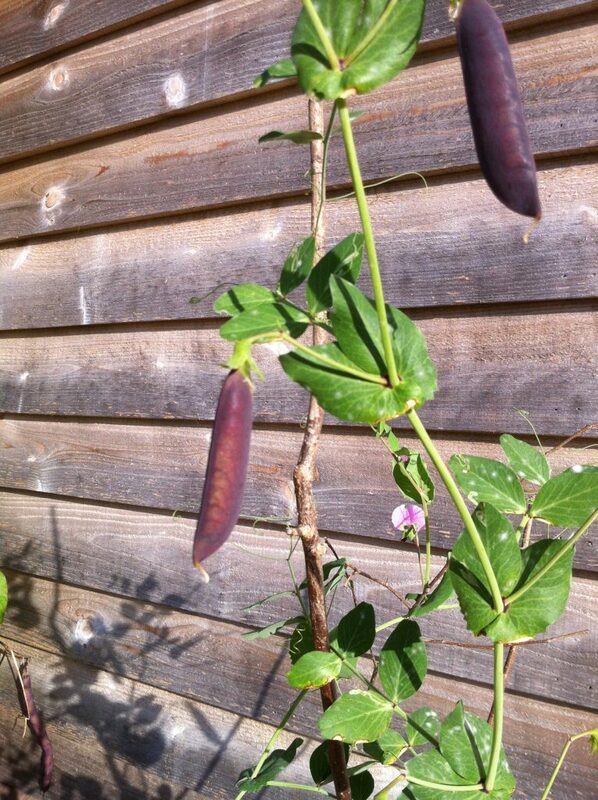 The third purple-podded pea I have grown this year has a great name but I cannot remember where I got it from! Hangman’s Door grows to about 1.2 metres. 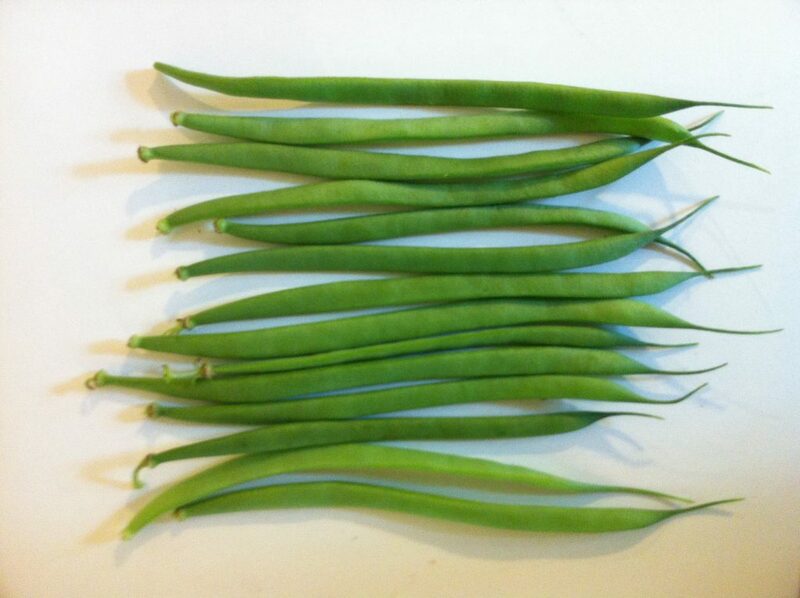 I had a disaster because of the eight peas I had to grow, my hens escaped one day and ate six of them. So with just two plants I have ten precious pods – after I ate the peas from a couple of pods to see just how nice they are – enough seed to grow on for a proper crop in 2017 maybe. 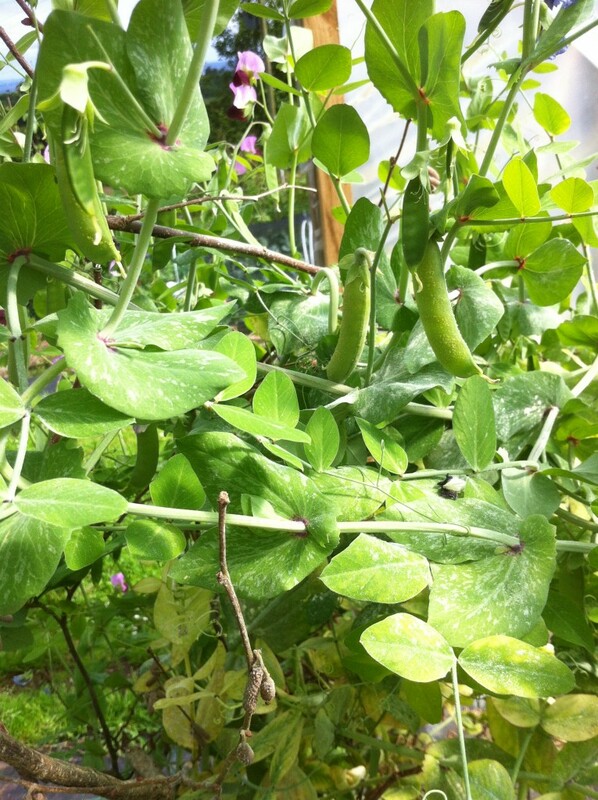 One can grow peas all year round. I was given a very special pea by my friend Jesus Vargas who lives in northern Catalonia. 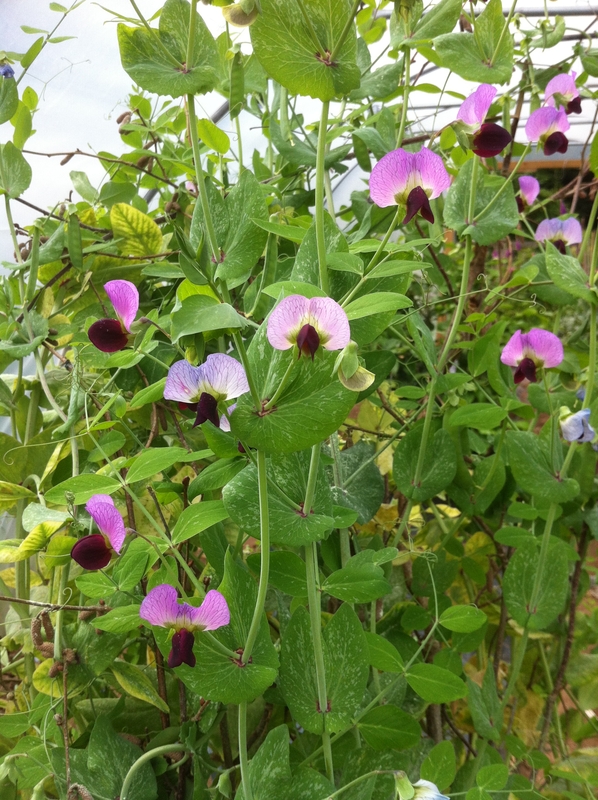 Pesol Negre del Belgarda is a very rare local variety of winter-sown tall pea that is grown for its black seeds which form a staple as a dried pea. It has the most gorgeous flowers and fat pods with a rough skin. 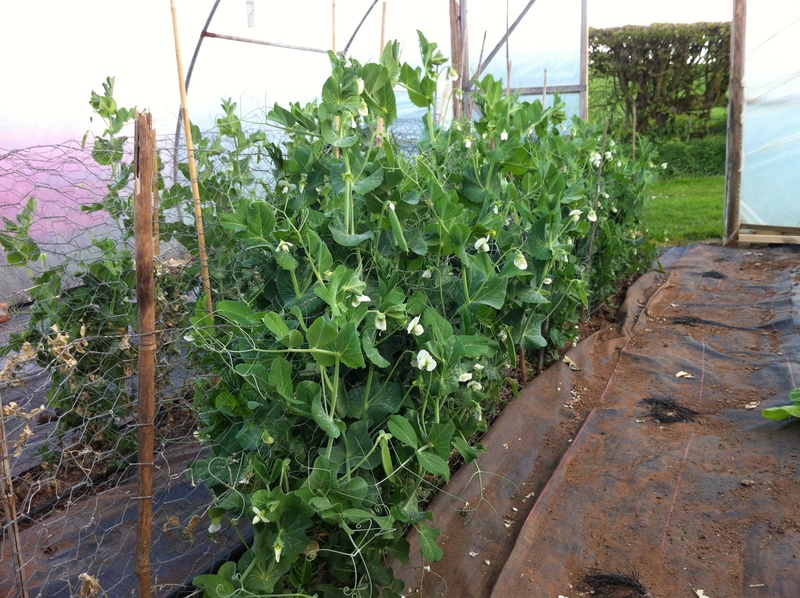 And finally a pea I sow in late autumn to harvest in May, a French stalwart that is commercially available, Douce Provence is prolific, tasty and hardy. I grow it in a polytunnel but the pea is quite happy sown outside in October and given some cloche protection through the worst weather until it starts to grow on in March. The Burmese Sour is something of a delight. It is a local variety and forms part of traditional Burmese cuisine. I am saving seed to share in 2017. 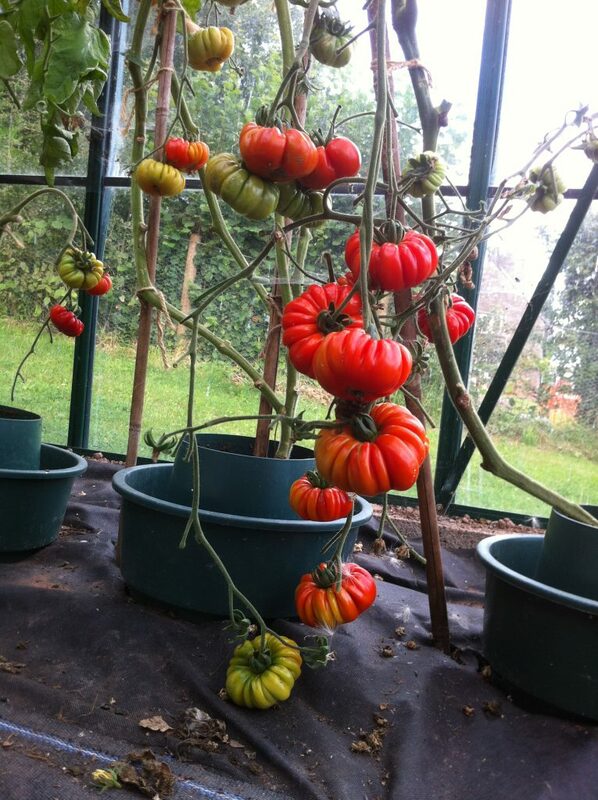 The tomato is early, prolific and lovely simply sliced with olive oil and a pinch of salt. My beloved is making spicy tomato and chilli jam with them and lots of passata too. I have blogged before about Syria and its plant breeding before the war. Syrian courgettes have a wonderful flavour, crunchy and firm textured.In 2011 I was given some local courgette seed of a variety that has a conical shape. Finally I have managed to grow enough to pollinate and harvest my first seed. I should have plenty to share in 2017, especially with Syrian refugees who want to grow the vegetables of their homeland . The mature fruits are 50cms long and I have at least eight of these still to harvest! I would love to receive Syrian and Burmese recipes using these veggies please. 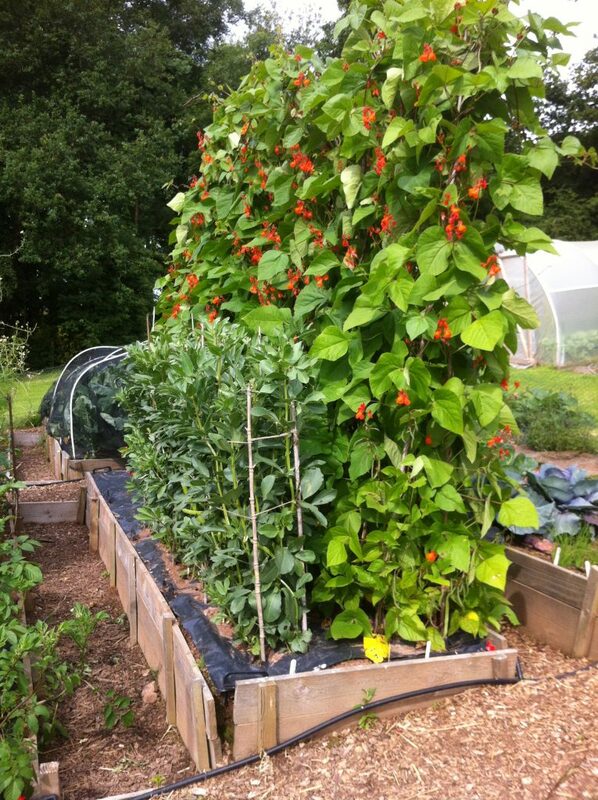 I am fortunate to be benefiting from a very productive year – so far – growing a range of beans to enjoy on the plate and also for seed to save, return to the Heritage Seed Library at Garden Organic and to share with other gardeners. 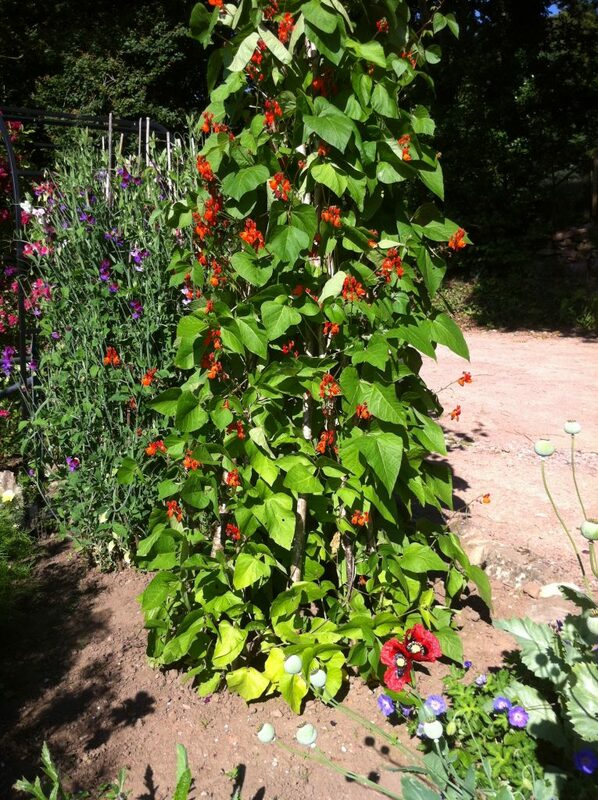 This year I am growing a runner bean called Montacute. 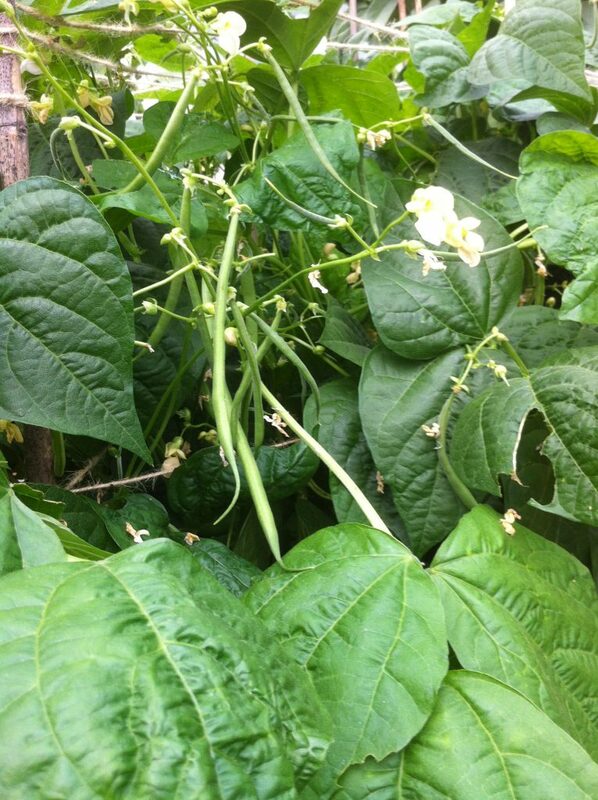 Because runner beans cross-pollinate easily due to bee activity I have my neighbours grow the same variety. I also grow a few in a distant part of the garden further isolated from neighbours. It is an heirloom from the Somerset estate of the same name. The flowering and pod set has been quite exceptional, due I think to a wetter than normal summer. As a Seed Guardian I receive small numbers of seeds every year from from the HSL. I like to grow these few seeds out to give me enough seed to grow sufficient quantities to return to the library the following year. Container growing can be very effective. 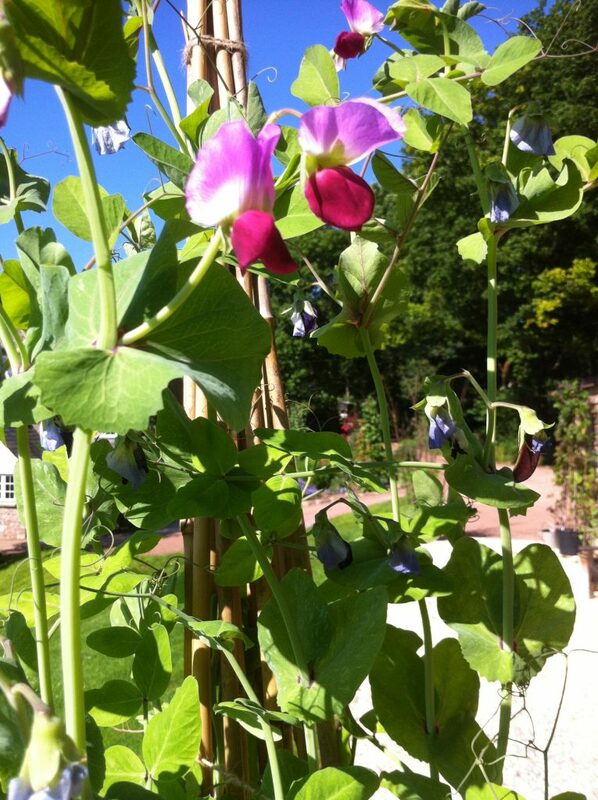 So this year I have a very pretty – and tasty – purple bean, Viola di Cornetti growing in a large tub. With nearly 500 varieties of vegetables in my library I need to refresh seed regularly and try to work on a seven-year cycle. This year I found myself with a few seed of a lovely HSL variety called Mrs Fortune’s that were last saved in 2009. Again, they are doing quite well in a large tub on a sunny veranda. 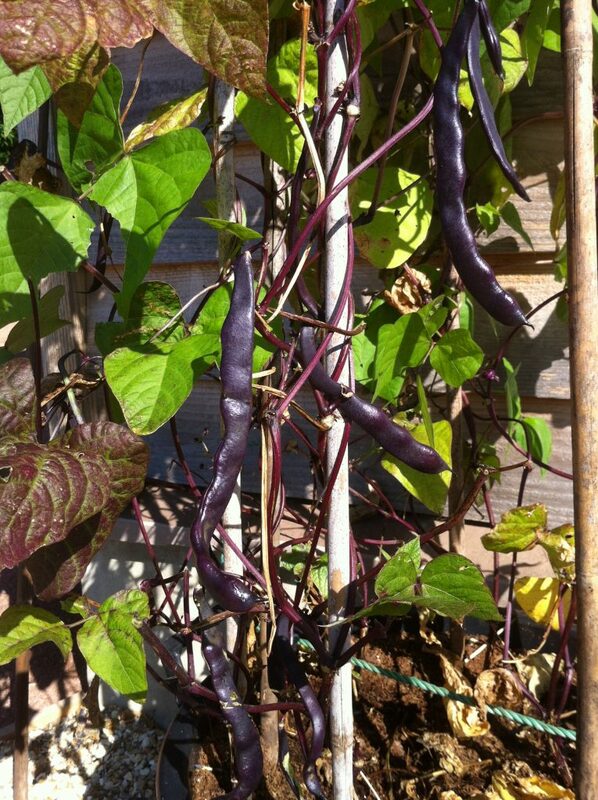 Another bean that was in the HSL catalogue this year is Madeira Maroon, a flat-podded French bean that can grow to 30 centimetres, but is best eaten when no more than about 20 centimetres in my opinion. Very tasty and quite prolific. One of my jobs as a seed detective is to identify varieties that have been lost in their country of origin, to propagate and return them. 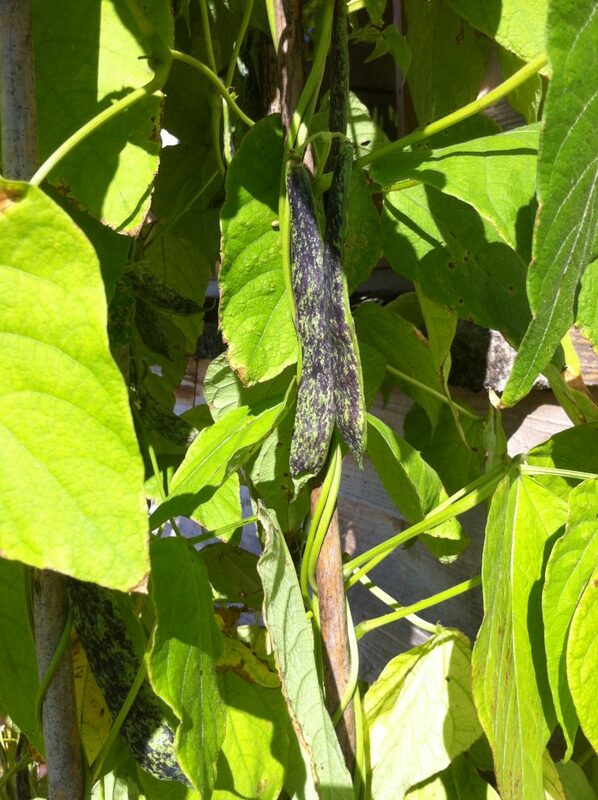 A fine example of this is another French bean that is in the HSL, Ray’s Butter Bean which hails from Australia. On a recent trip to Victoria I met with the man who is at the forefront of growing heirlooms, Clive Blazey founder of The Diggers Club who told me he had never heard of it! As well as returning seed to the HSL I shall send him enough to start a re-introduction programme. And then there are the dwarf beans. 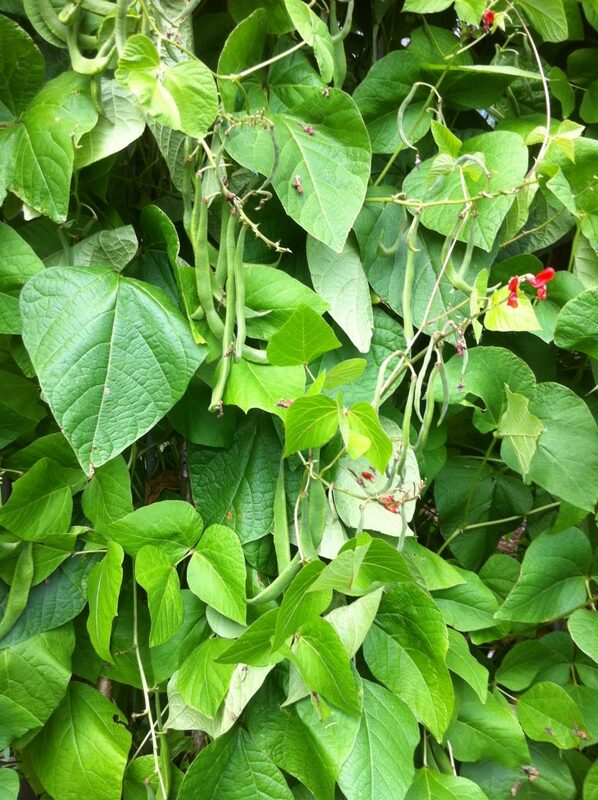 Val’s Bean is a delicious, if somewhat unruly bean that has been in my library for years. Now I am growing a quantity to return to the HSL after not having grown them in the last seven years. My favourite French bean is Emperor of Russia. Finding myself very short of fresh seed this is another one I am propagating this year. 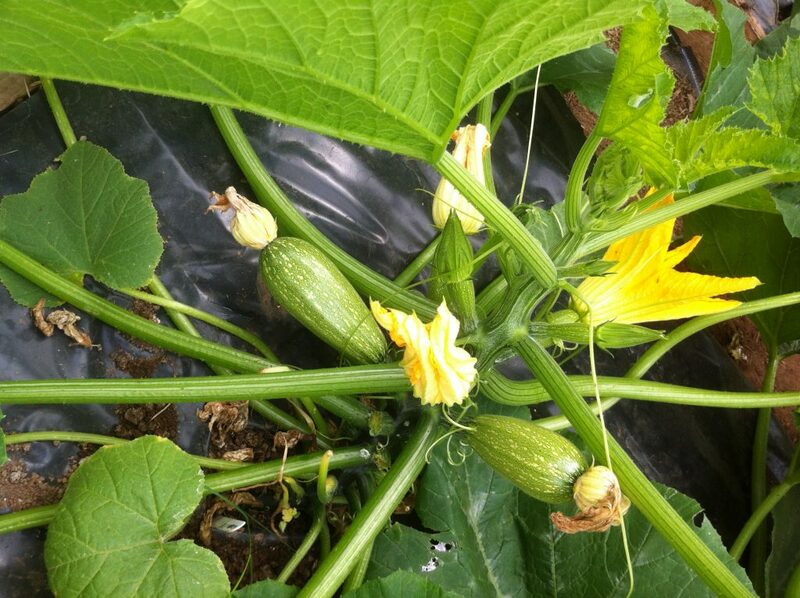 From a March sowing the crop is now ripening and drying in a polytunnel ready soon to be harvested. 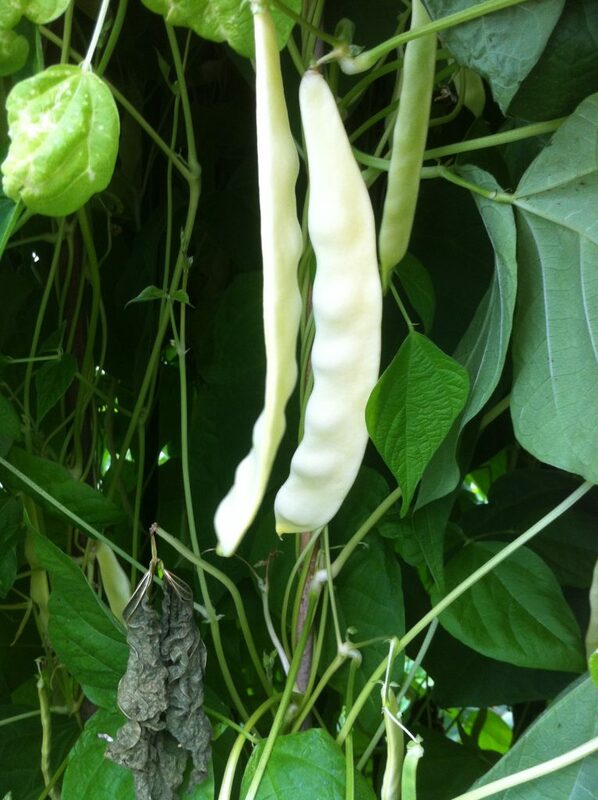 Many of the beans I grow are cropped for use as a dry bean. An American variety, Vermont Cranberry, is one such. 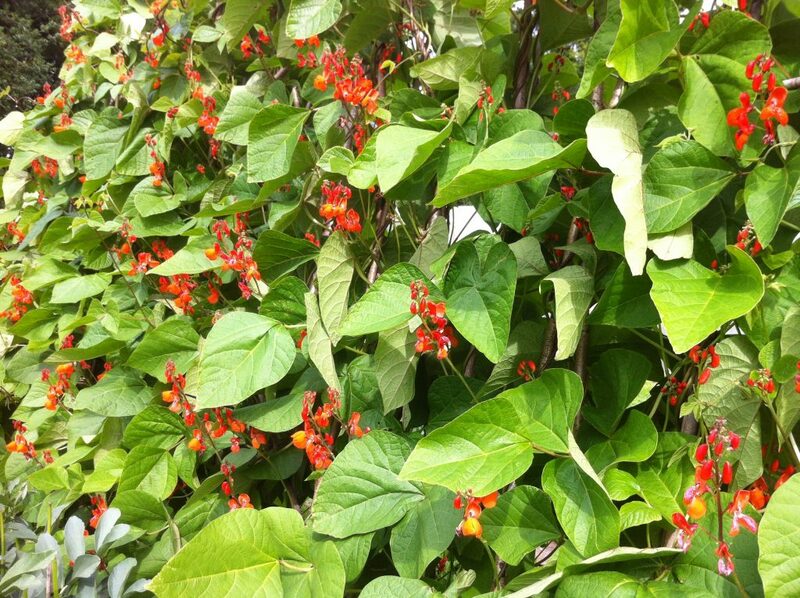 Easy to grow yielding beautiful cranberry-coloured beans, this HSL stalwart is well worth adding to your vegetable plot. 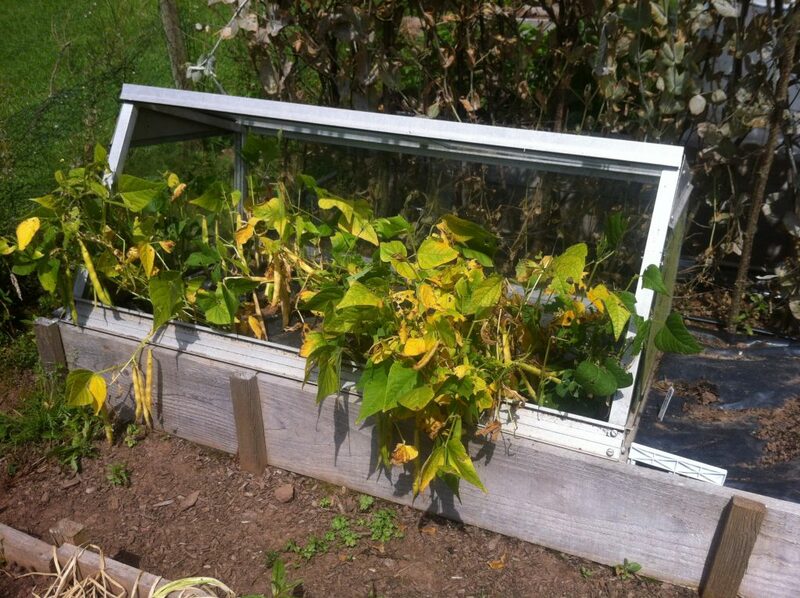 I grow them in a cold frame on a raised bed to help growth from an early sowing and to protect the crop from rain as the pods dry. I love my peas and this year I have so many on the go, some new and some to replenish my stocks of seed as well as to eat! This little darling is Betany Blue, an HSL variety of which i had just eight seeds so a precious cargo. None will be eaten, all will be saved for a proper harvest next year maybe. My most decorative and also delicious delight so far this summer is Jeaune de Madras, given to me by a fellow vegaholic in Holland. 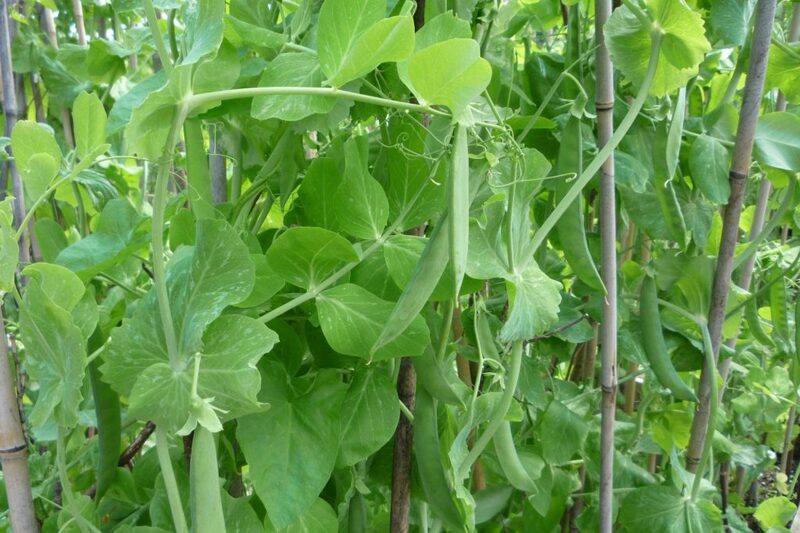 Peas are native to India so the name is no surprise. the colour is. My first yellow mange tout and as yummy as she is lovely to look at. I shall be saving seed and growing them in the future as a border climber as the lovely bi-colour purple and pink flowers, yellow/green stems and young leaves and verdant habit will make them an essential edible addition to the garden. 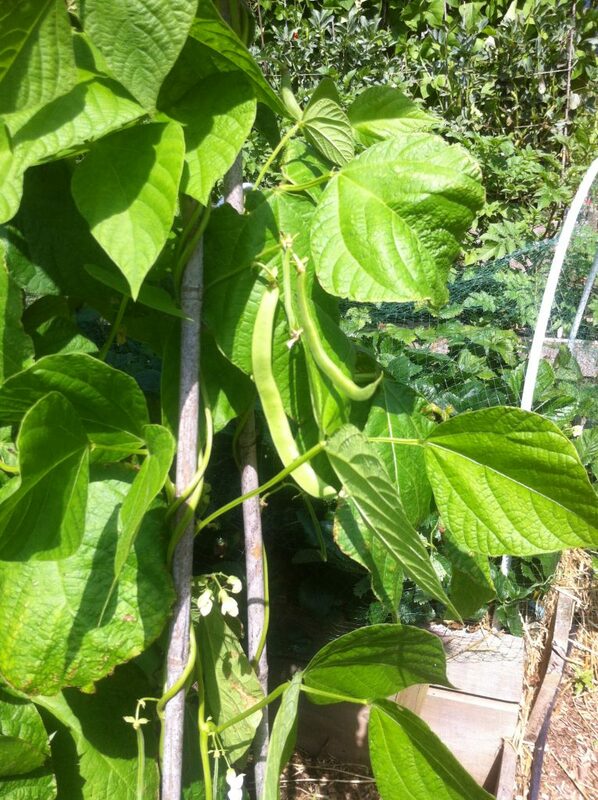 Next up is an old favourite which is currently setting pods and will be ready to harvest in a week or so. Robinson,, a Heritage Seed Library ex-commercial variety is, for me the prince of peas. 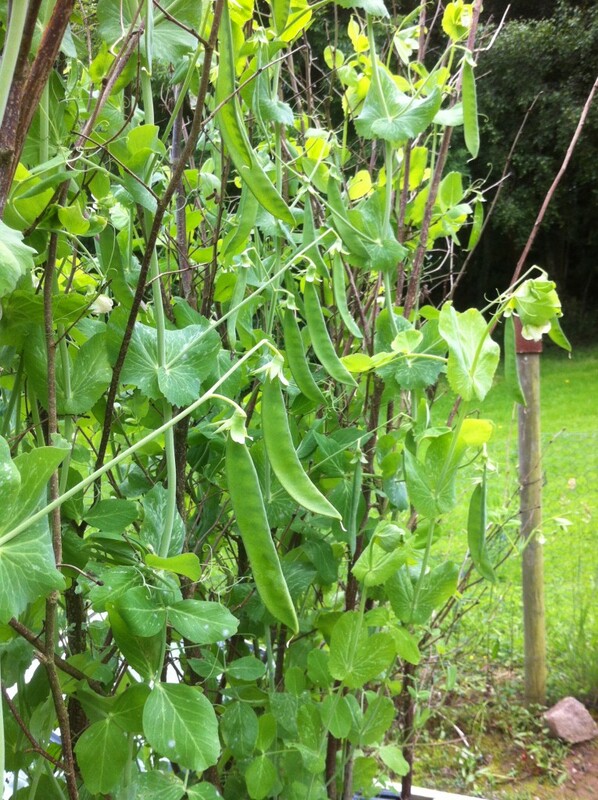 Deliciously sweet, great long pods with ten or more peas that are hard to resist once picked. There are some seedsmen selling Robinson but I have no idea if theirs is the same as the HSL variety which has proven provenance as the original Robinson pea as bred by a certain Mr Robinson. 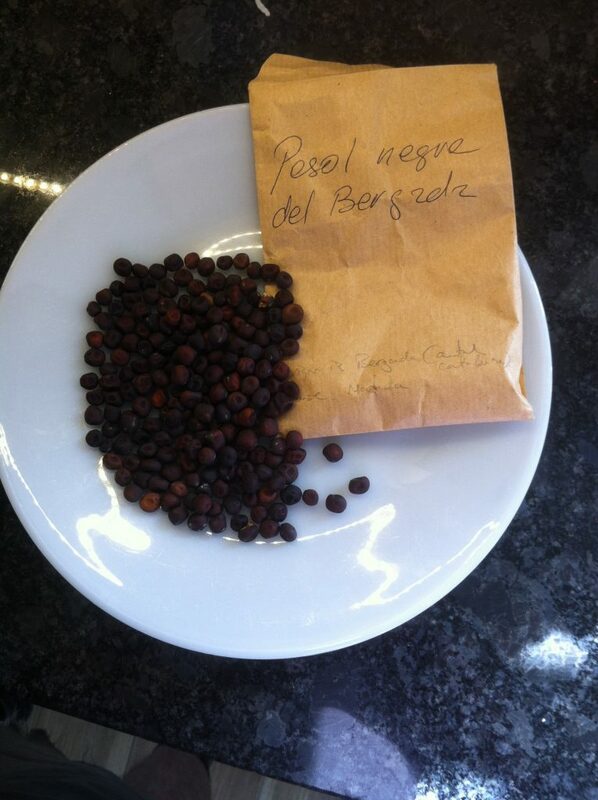 A very rare Catalan heirloom is the drying pea fesol Negre de Belgarda, which was given to me by Jesus Vargas. 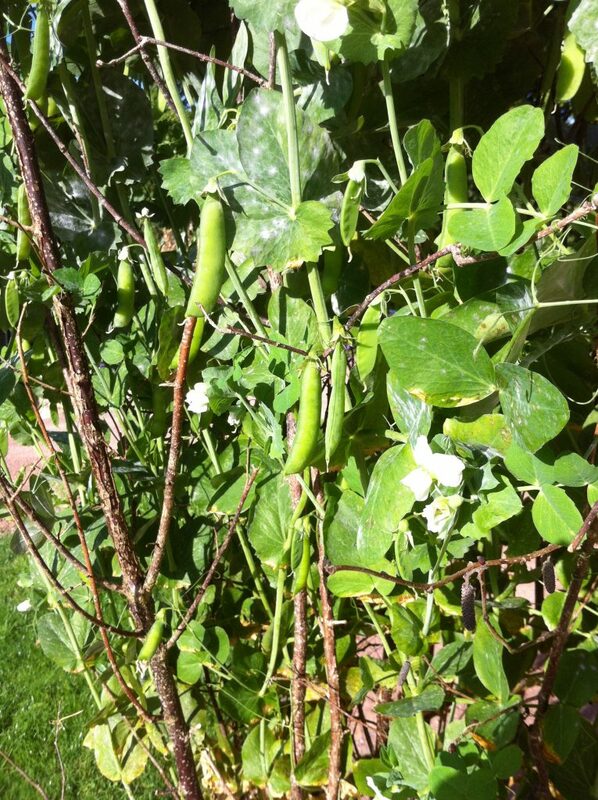 I grew it last year but some peas shed their harvest behind my back and I have some more growing in a polytunnel which are most decorative. The flowers are lovely and the peas small. They turn almost black when dry and were a staple of the region. Harvested already have been a French variety, Douce de Provence, which I grew over winter in a polytunnel. A very hardy variety which does especially well under cover. This photo was taken in mid-April as the first flowers were showing themselves and setting had just started. 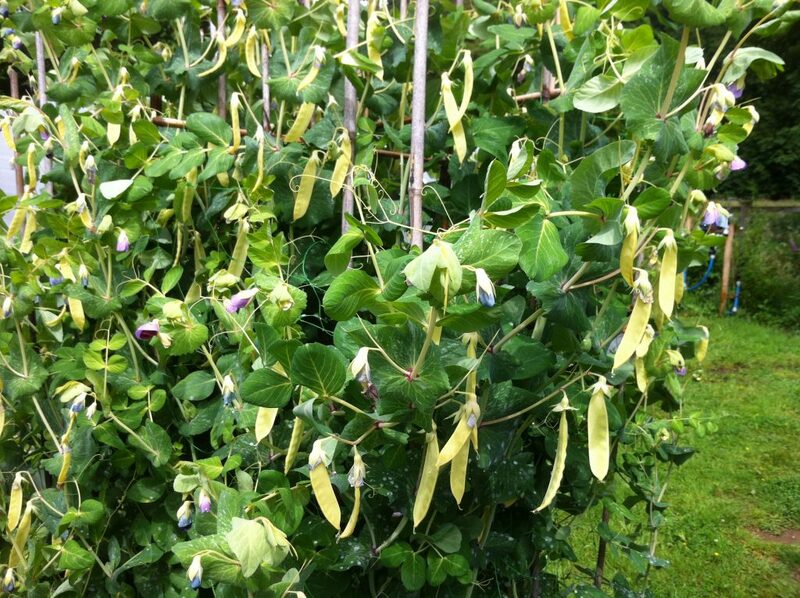 I have made recent sowings of a number of other varieties, mostly in large tubs and the garden border; Champion of England, regarded by many at the time it was popular a hundred years ago, as being one of the ten best peas in the world. I’ve had a disaster with a variety given to me by an HSL member whose name I have forgotten sadly called Hangman’s Doors. I could only get three peas to germinate so they are precious little seedlings right now. Another very fine French variety that grows to about a meter, Espoir de Gremboux, again an HSL variety along with Suttons Purple Podded I am growing especially for the HSL this year. Last but not least, an Irish heirloom, Daniel O”Rourke. Named after the man who grew them originally and that was in the Vavilov collection in St. Petersburg but was given to me by a fellow member of the HSL in Scotland. 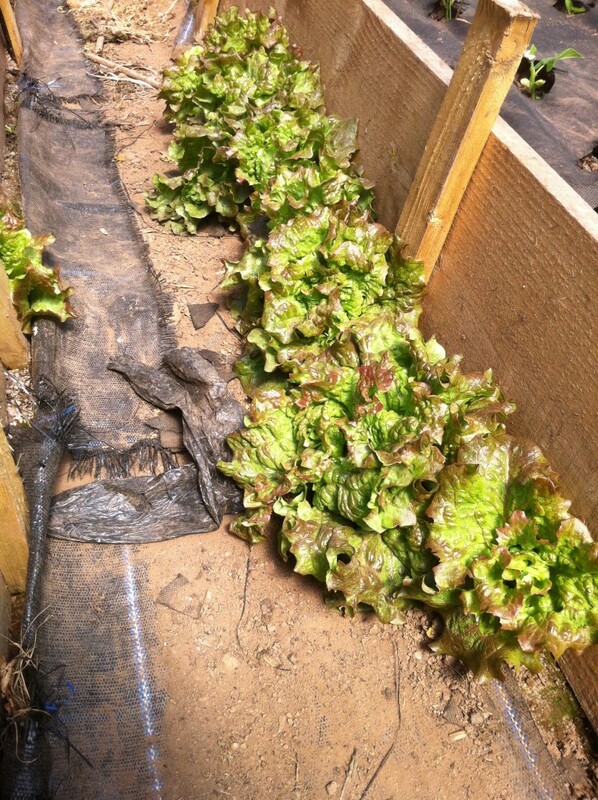 The winter of 2015/16 has been great for salad crops. 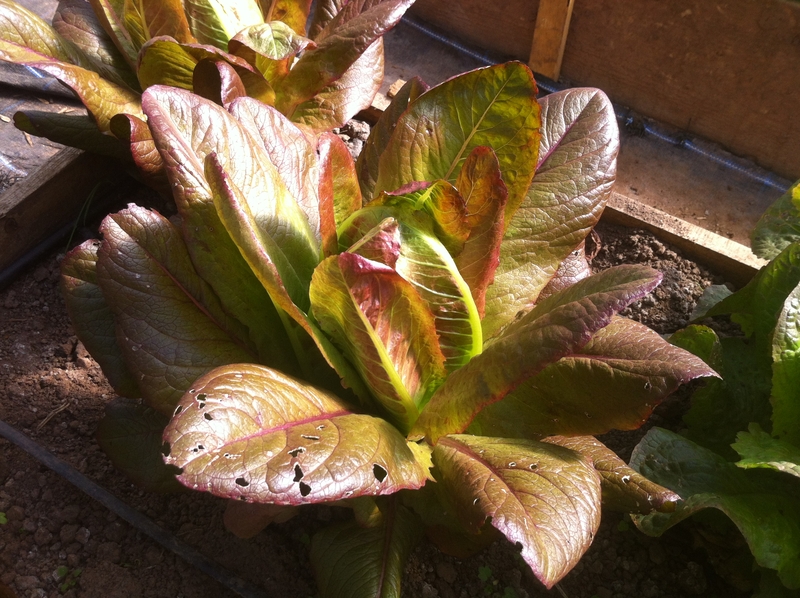 The mild weather has meant that even a summer lettuce like Little Gem has survived through the winter and makes a tasty addition to the hungry gap. This little darling was harvested over the weekend. 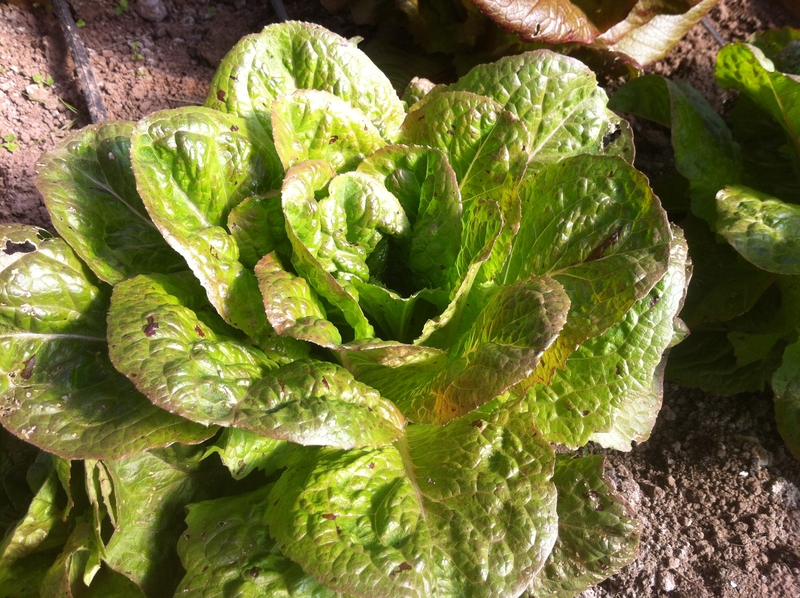 There are a trinity of rather lovely winter lettuce that are now almost at end in my garden.. Sown between September and October last year, they have provided me with a delicious and varied crop until now. First up is Latuccino, an Italian variety that was given to me by the gardener who looks after my old school’s two-acre bio-dynamic walled garden. 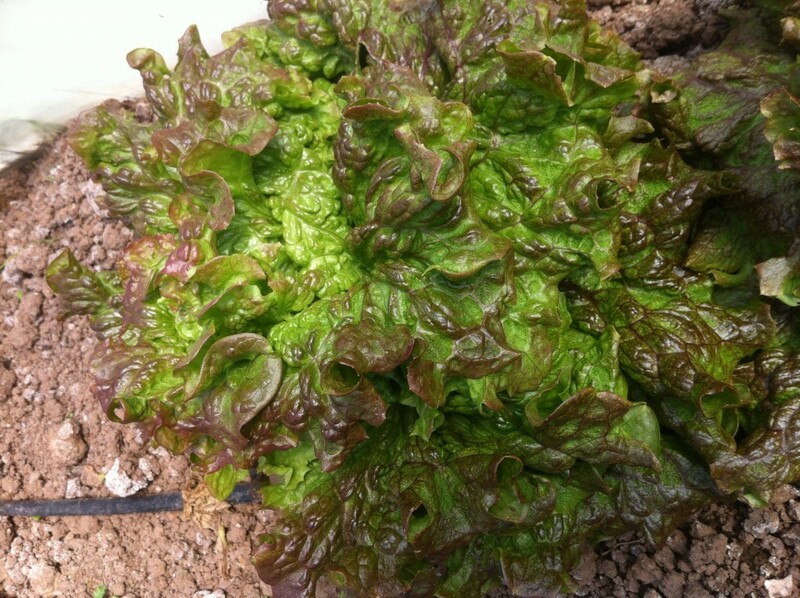 Grown as cut-and-come-again, I start thinning them in early January to 30cm apart and allow them to heart up. 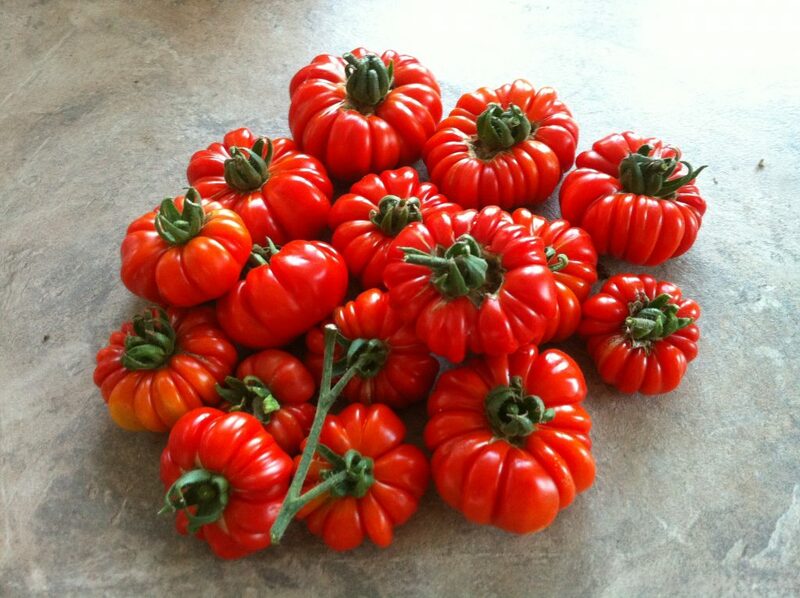 This is a truly delicious variety – sharp and tangy; one of my absolute favourites and well worth growing. I save seed of Latuccino and it does have a habit of self-seeding! 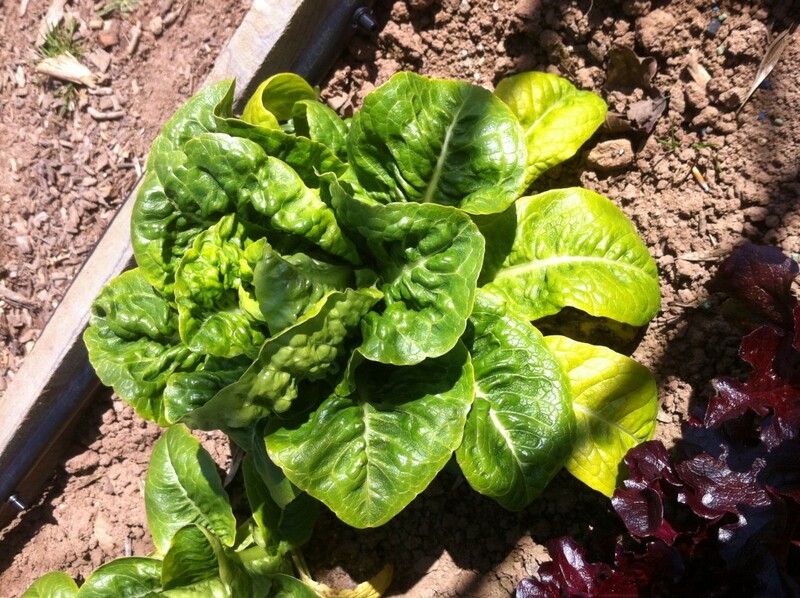 The trinity of lettuce includes two that come from Garden Organic’s Heritage Seed Library. First up a wonderful French loose cos type, Rouge D’Hiver that has a taste that is quite unimpeachable; crunchy, sweet and colourful too. And finally, an English variety, Bloody Warrior. The blood-red spots on these super-sweet green leaves tell it all. I plan to grow this variety for seed for 2017. I am just returned from a manic but hugely enjoyable trip to Australia attempting to persuade some broadcasters that they should be commissioning a new series called The Seed Detective which would tell the amazing stories about how our fruit and vegetables found their way into our food culture. These are stories about human colonisation, genetics, and the importance of conserving what is left of the genetic diversity of our food. Saving, seeking out and enjoying traditional, ex-commercial, heirloom and native varieties is what makes me tick. 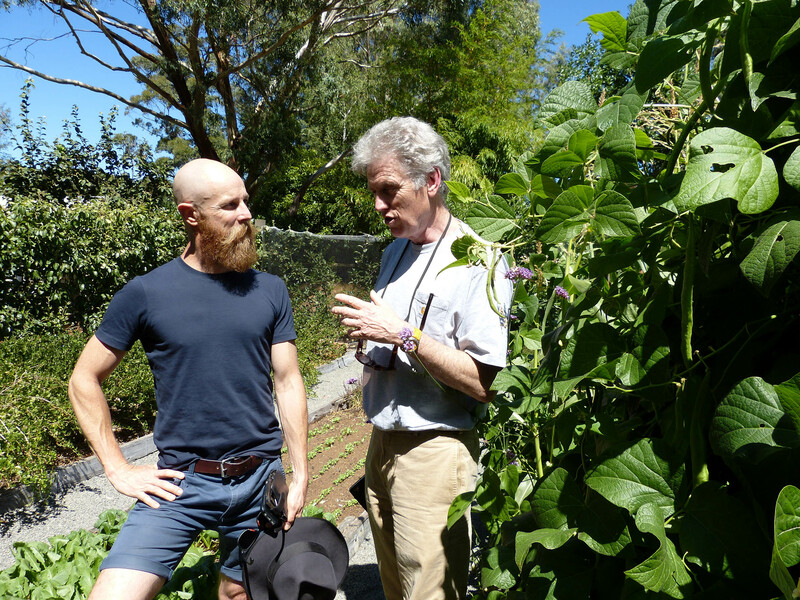 Victoria is a garden state and I met with cellist and heirloom gardener Simon Rickard who has written a wonderful book about heirloom vegetables. 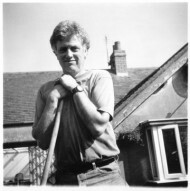 Clive Blazey created a wonderful institution, the Diggers Club. He grows, tests and sells native and heirlooms from his garden centres near Melbourne. If you are in the area go and visit them. This magnificent golden pumpkin is nameless. Another case for the seed detective. It has been an amazing winter for requests for seeds. I have been cleaned out by numerous enthusiasts who want to grow some examples from my library. As a result I am not sending out any more seeds until later this year. Do watch this space for further news.